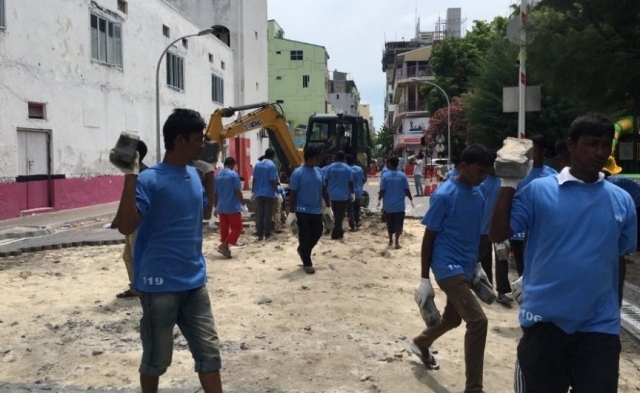 Ministry of Housing and Infrastructure has started the repair work on the streets of the Maldivian capital – Male’. Workers started repairing the western end of Majeedhee Magu this Saturday morning; removing the bricks and leveling the ground. Majeedhee Magu – from Rasfannu Artificial Beach to Izzuddin Magu – will be closed for 14 days for the work. Ministry of Housing and Infrastructure reported that Majeedhee Magu will be divided into nine sections, with each section scheduled to be completed within every two weeks. The work on Majeedhee Magu is scheduled to be complete in by February 4, 2017. Ministry of Housing and Infrastructure reported that it wanted to solve the problem of portholes and flooding by leveling the ground and constructing better street drains. Workers will also be building ramps to make it easier for people with disabilities who use wheelchairs to get on and off the pavement, as well as installing more fire hydrants.